New Weaverville customer purchased a home with an existing water softener and iron filter system. They came into our office to have their water tested because they were not sure how long it had been since the previous service. The Free water test showed iron coming through into the home as well as hard water. We went to the home to perform the service to find out that the existing equipment was at the end of its life and needed more work than anticipated. They decided to get all new equipment, so they didn’t have to worry about that any longer. 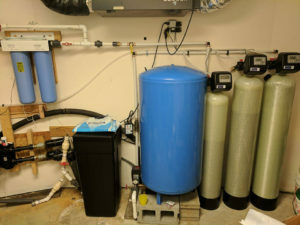 We installed our American Made iron filter for iron issues, a neutralizer to raise the low pH (acidic water), and a water softener to remove the hardness. They now have crystal clear, great tasting water!